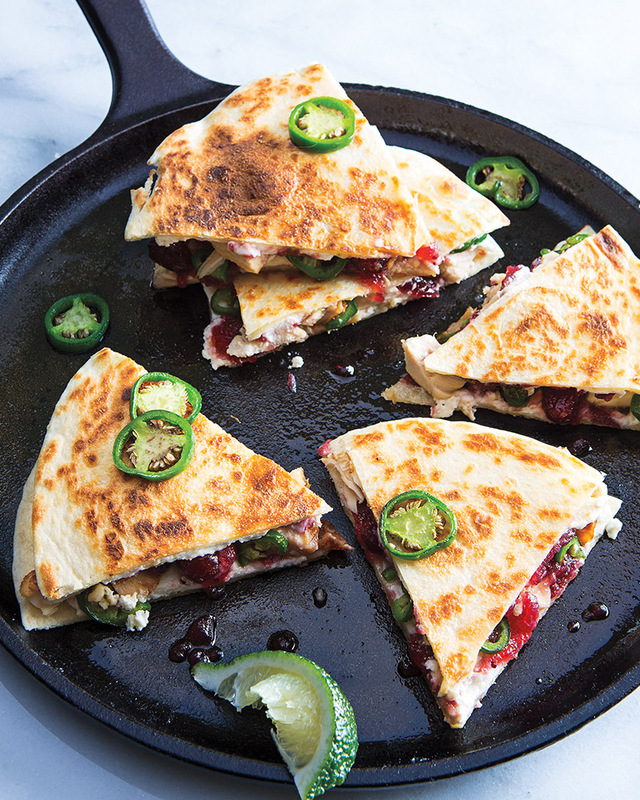 3.In 2 batches, spray large skillet with cooking spray; add 1 quesadilla and cook over medium-low heat 2 to 3 minutes or until bottom is golden brown. Spray top of quesadilla with cooking spray; turn and cook 2 to 3 minutes longer or until bottom is golden brown. Cut each into 6 wedges; serve with reserved wedge of lime. > Try swapping out the flour tortilla for a 100% whole wheat tortilla. Instead of using a canned cranberry sauce this holiday season, make your own! Place cranberries, pineapple and orange juice in medium saucepan. Bring to a boil, reduce to medium-high heat, and simmer 10-15 minutes. Use the back of a fork to smash cranberries into a chunky paste. Add sweetener, as desired, and allow to cook 10 minutes. Transfer to a glass bowl and allow to cool. Store in the refrigerator for up to 5 days.